They’re both tiny, novice-friendly DSLRs, so how do you choose between them? Canon EOS 250D/Rebel SL3 versus EOS 200D/Rebel SL2 – which one should you buy? It’s always a dilemma when someone launches a new camera. Do you go for the latest model when it’s right at its most expensive, or do you go for the camera it replaces, which often stays on sale at reduced prices? Canon likes keeping older models on sale alongside newer models, so choosing the best Canon camera is always tricky. We’ve put together this step-by-step comparison between the new EOS 250D/Rebel SL3 and the older EOS 200D/Rebel SL2 to help you decide. These cameras have different names in different territories, so where we refer to them as the EOS 250D and EOS 200D, remember in North America they are the Rebel SL3 and Rebel SL2 (and ‘Kiss’ in some other territories). Canon launched the EOS 250D/Rebel SL3 without any great fanfare, presumably realising that the differences were evolutionary rather than earth-shattering. It’s true that a lot of things in the new camera are exactly the same as the old one, though there are also some important differences. We already rate the EOS 200D/Rebel SL2 as one of the best cameras for beginners, if not one of the best DSLRs, so the EOS 250D/SL3 has a lot to live up to. Let’s start by getting the things that are exactly the same out of the way. Don't go looking for any differences between these two cameras on the outside as they are physically identical – apart from the badge. For a start, the EOS 250D and EOS 200D look pretty much identical because they are. They both measure 122.4 x 92.6 x 69.8mm, making them the tiniest ever APS-C DSLRs with flip-out screens, and that doesn’t change with the EOS 250D. Both cameras come in black, white and silver versions, and both share the same 1g difference in weight between the different finishes. Somehow the EOS 250D works out 4g lighter overall than the 200D, but we’ve no idea why. Both cameras have the same optical pentaprism viewfinder, offering 95% coverage and 0.97x magnification, and the same 9-point phase-detection autofocus system for viewfinder shooting. The 5fps continuous shooting speed/burst rate is unchanged, and round the back there’s the same 3-inch vari-angle 1,040k-dot touchscreen display. The 63-zone dual layer metering sensor is the same in both cameras and the Evaluative, Partial, Spot and Centre-weighted metering modes are unchanged. The shutter speed range on both cameras goes from 30-1/4,000sec plus B, and both the EOS 250D and EOS 200D have a pop-up flash with a Guide Number of 9.8m at ISO 100. The ISO range on both cameras is the same, at ISO 100-25,600, going up to ISO 51,200 in expanded mode, and they both take a single SD/SDHC/SDXC UHS-I compatible memory card. And even though the ‘effective’ sensor resolution appears to have changed from 24.2MP to 24.1MP, in fact both cameras shoot 6,000 x 4,000 pixel still images and the change in numbers is just a technical red herring. 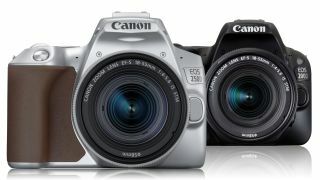 With identical dimensions and near-identical weight, the real differences between the EOS 250D/Rebel SL3 and the EOS 200D/Rebel SL2 are on the inside. The fact is, if you’re into regular stills photography and you already more or less know your way around a camera, the EOS 250D/Rebel SL3 has nothing that the EOS 200D/Rebel SL2 hasn’t already got. BUT, if this is your first proper camera, you’re a DSLR novice and you’re interested in video, vlogging, social media sharing and broader ‘content creation’, the EOS 250D/Rebel SL3 brings some important advantages. This is the big one. Where the existing EOS 200D can capture full HD video at up to 60/50 frames per second, the EOS 250D embraces the 4K revolution to bring 4K video capture at up to 25/24fps. We’re used to seeing this on mirrorless cameras, but it’s the first time we’ve seen 4K on a low-cost DSLR. This is the other big difference. Video on DSLRs has been problematic in the past. In live view mode, DSLRs can no longer use their dedicated phase-detection autofocus modules and have to rely on sensor-based focusing systems instead. Canon’s Dual Pixel CMOS AF system brings phase-detection AF to the sensor itself, and the system in the EOS 250D is a massive upgrade over the EOS 200D, with an amazing 3,975 user-selectable AF points, additional AF modes and sensitivity down to -4EV, 2EV better than the EOS 200D. The EOS 250D is now a match for any mirrorless camera in live view mode – perfect when you want to use the screen not the viewfinder. Camera processors sound like pretty boring things, but they’re central to the camera’s features and operational performance, and in the EOS 250D Canon has upgraded the processor to a DIGIC 8, and this appears to be behind many of the new camera’s improvements… including battery life. This is quietly hidden away in the specs sheets, but the EOS 250D offers a massive increase in battery life in regular viewfinder shooting, going up from a reasonable 650 shots in the EOS 200D to an excellent 1,070 shots in the new model. In live view the gain is much smaller, increasing from 260 shots to 320, but this shows the much heavier power drain of digital displays – and why people still choose DSLRs when so many pundits claim mirrorless is the future! The existing EOS 200D is already a pretty novice-friendly camera, but the EOS 250D goes a whole lot further, with a Creative Assist mode for applying a range of image effects both while you’re taking pictures and for pictures you’ve already taken. It also has Canon’s clever Guided UI (User Interface) to walk new users through the basics of photography and camera operation. This makes the EOS 250D great for anyone upgrading from a smartphone or a simple point-and-shoot model to a ‘proper’ camera, and also encourages the experimentation and discovery that DSLRs are so good for. For regular stills photography the EOS 250D/Rebel SL3 has few advantages over the EOS 200D/Rebel SL2, but for video fans, novice users and smartphone upgraders, the newer model has real appeal. On the face of it, the Canon EOS 250D/Rebel SL3 looks like a pretty modest upgrade of the existing EOS 200D/Rebel SL2, and for stills photographers who only occasionally dabble in video, the older camera will give you exactly the same quality and features as the new one, but at a lower price. But for anyone who is keen to explore video and stills together, and is still learning about photography and its potential, the EOS 250D/Rebel SL3 is the better camera. It’s better for video, better for live view operation and better for helping you learn the basics. If that sounds like you, then we think it’s worth the extra. Whichever one you go for, while it's cheaper to buy these cameras body-only, we'd always recommend paying just a little extra to get them with the Canon EF-S 18-55mm f/4-5.6 IS STM kit lens.